Some 25% of the supporters of Barack Obama have posted their presidential preference and 20% of backers of Mitt Romney have done so. This difference is not statistically significant. Social media platforms have also become a notable venue for people to try to convince their friends to vote. More broadly, registered voters have used a variety of methods to talk to others about voting. Below are the ways that people are hearing from their family and friends, encouraging them to vote. But some demographic groups were more likely to get these messages in different channels. 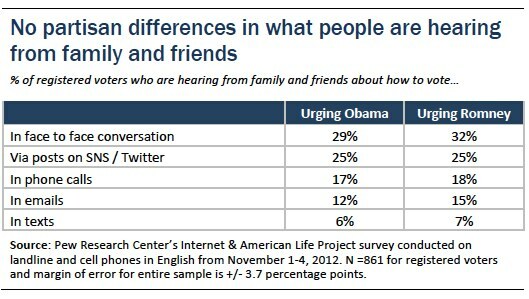 48% have heard from family and friends in face-to-face conversations in the last 30 days that they should vote for either Obama or Romney. Younger voters ages 18-29 were considerably more likely than others to have heard in face-to-face conversations from others in their circles about voting for Obama. 30% have heard from family and friends via postings on social networking sites (SNS) or Twitter in the last 30 days that they should vote for either candidate. Overall, female registered voters were more likely to hear from family and friends via social media postings that encouraged them to vote for each candidate. And registered voters under age 30 were more likely to get “go and vote” messages from family and friends. 29% have heard from family and friends in phone conversations in the last 30 days that they should vote for either candidate. 21% have heard from family and friends in emails in the last 30 days that they should vote for either candidate. 11% have heard from family and friends in text messages that they should vote for either candidate. The registered voters ages 18-29 were more likely than their elders to have gotten pro-Obama texts from their friends and family. 54% of registered voters have had face-to-face conversations in the past 30 days with others, encouraging them to vote for either Barack Obama or Mitt Romney. 25% have talked on the phone with others, encouraging them to vote for one of the candidates. 20% have posted voting messages to others on a social networking site (SNS) or Twitter, encouraging them to vote for one of the candidates. 12% have sent emails to others, encouraging them to vote for one of the candidates. 10% have sent text messages to others, encouraging them to vote for one of the candidates. Finally, 22% of registered voters have announced on a social networking site or Twitter how they voted or planned to vote. Some 29% of those under age 50 have announced to their networks through social media how they voted or planned to vote, compared with 17% of those 50 and older who have revealed their vote by social media. 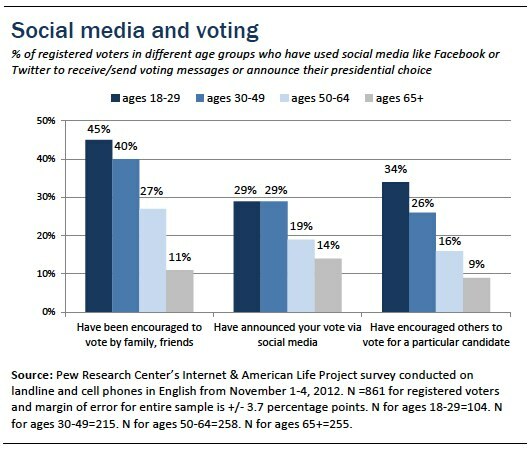 In all, those who did any of these activities related to getting messages about voting, sending out such messages, or posting their presidential choice on a social media site are part of our calculation of the “social vote” cohort. And that comes to 74% of registered voters.